Paper plate crafts are among my favorite! 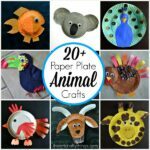 I not only love the simplicity of using a paper plate for crafting but I also adore how you can pretty much make anything imaginable out of them. For instance, have you ever thought to yourself, I wonder how many different ways I can make a turkey out of a paper plate? I don’t have a final answer to that yet but I can tell you that I alone have six awesome ideas to share with you today. 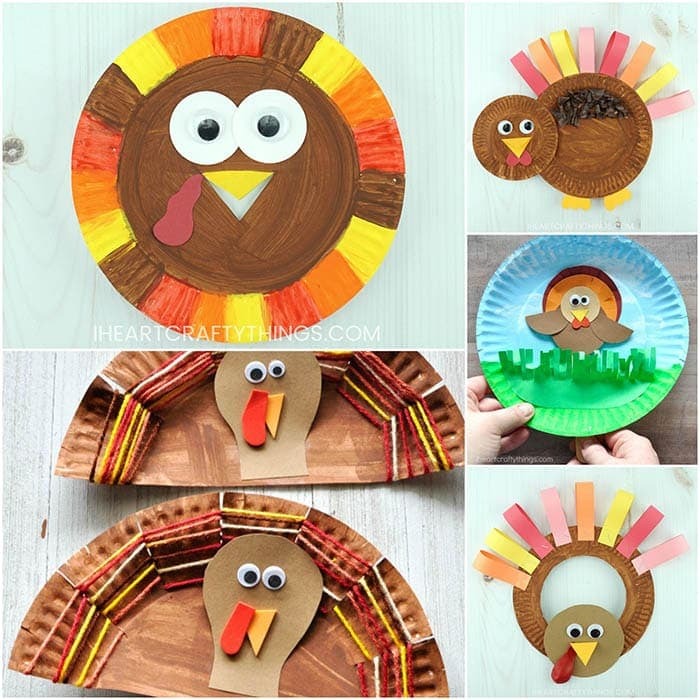 These paper plate Thanksgiving crafts are simple, fun and perfect for arts and crafts time. 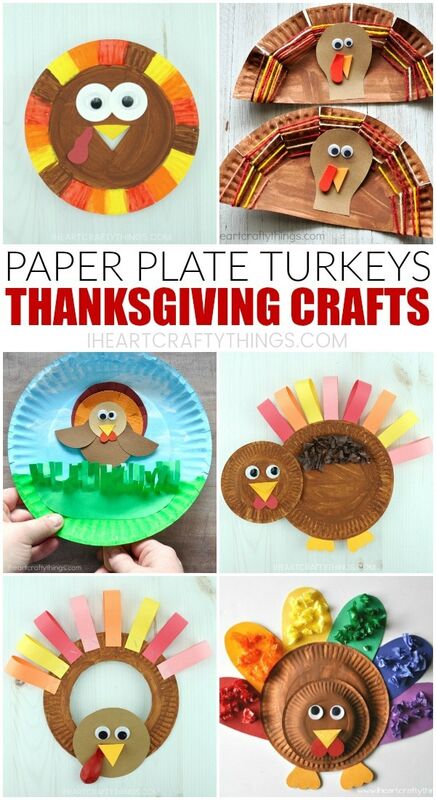 Click on the title links underneath the photos to be taken to the full paper plate Thanksgiving crafts tutorials. If you would like to share this post (please do!) we would appreciate if you would use the top square image for social shares or the vertical image at the bottom for pinning. 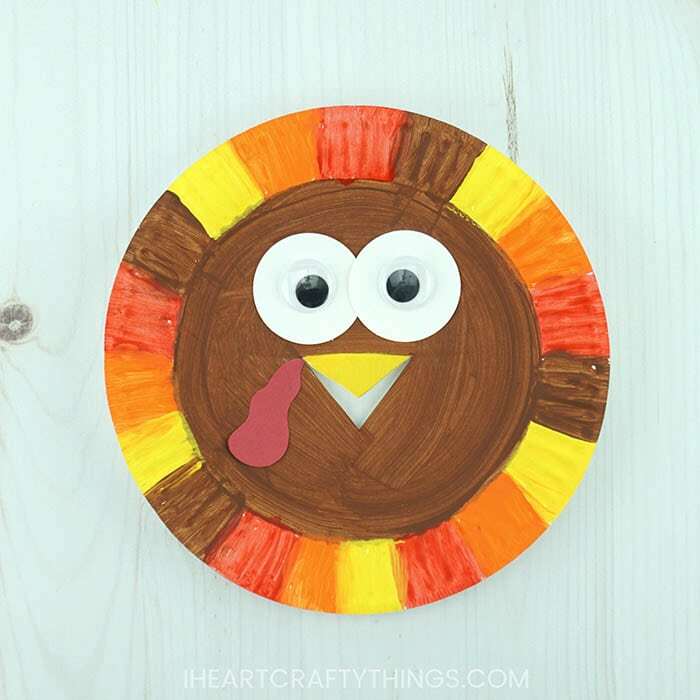 Here is a clever way to turn a paper plate into a cute paper plate turkey wreath for Thanksgiving. After making the craft kids can hang it up on a doorknob or hook on a mantel for some festive Thanksgiving decor. 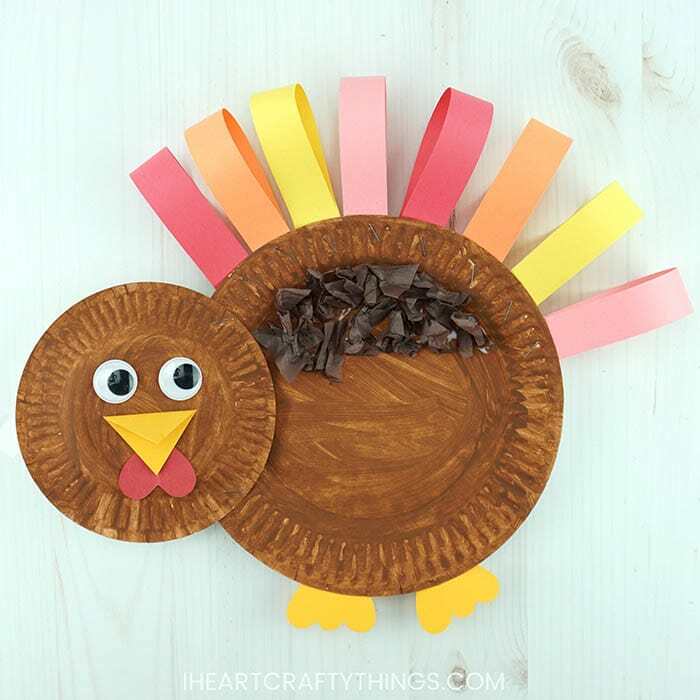 Could this adorable paper plate turkey craft get any more cute?! We combined this colorful turkey craft with the book, A Plump and Perky Turkey by Teresa Bateman. 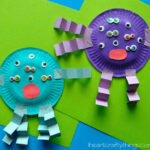 The craft is a perfect way to combine story time and arts and crafts time together in one afternoon. 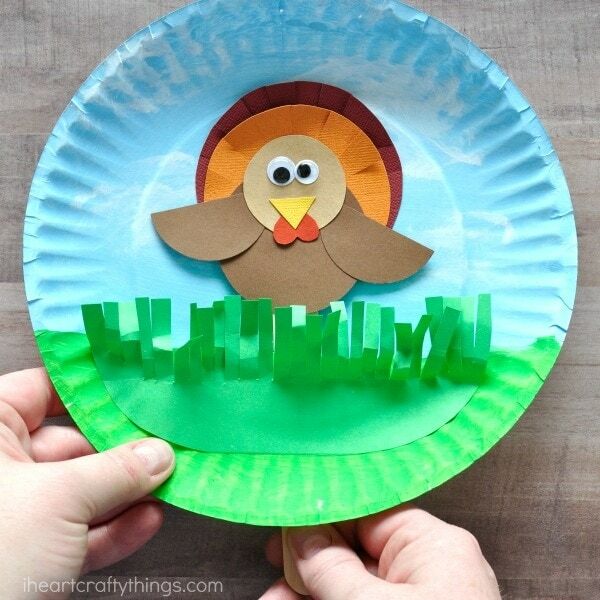 A small paper plate and large paper plate combine together to create this darling paper plate turkey craft. The added tissue paper and construction paper feathers add such fun dimension to this craft. 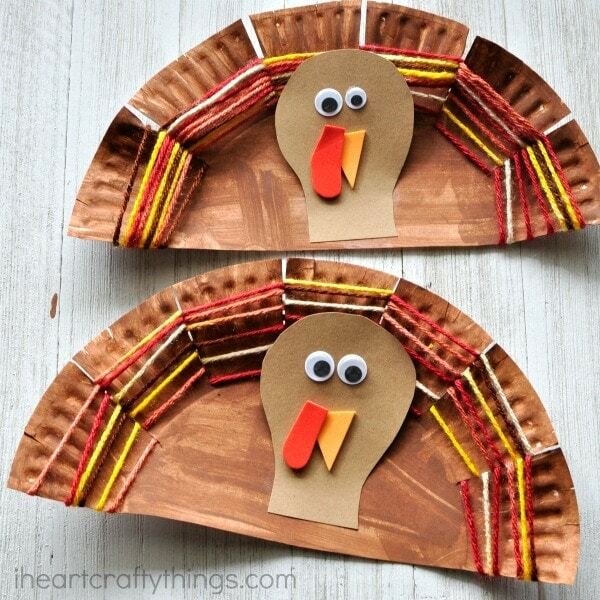 Here is a fun way to turn a Thanksgiving craft into a fun fine motor activity. 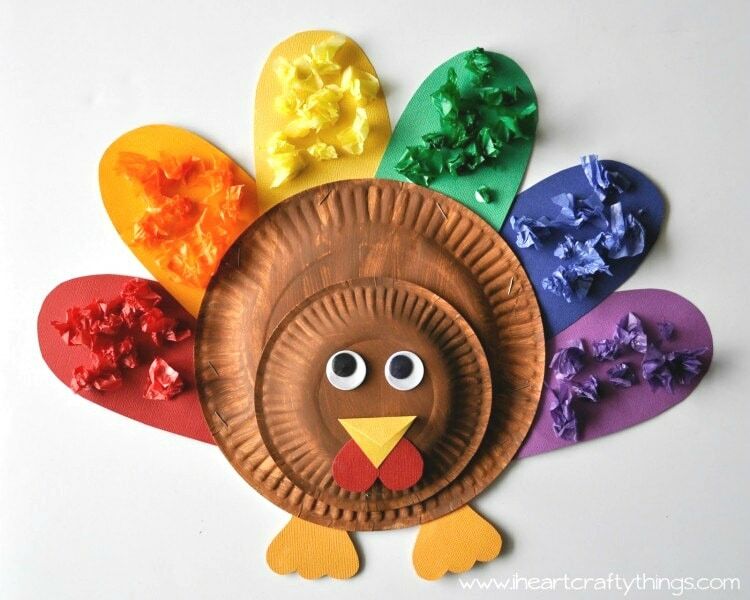 After kids make their paper plate turkey craft they weave yarn up and down through the paper plate sections to make colorful turkey feathers. 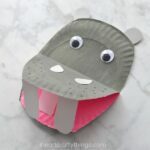 Kids will have a blast making and playing with this turkey puppet craft. After making the craft kids watch as the turkey moves up and down, hiding in the grass and popping back out when you move the popsicle stick around the paper plate. 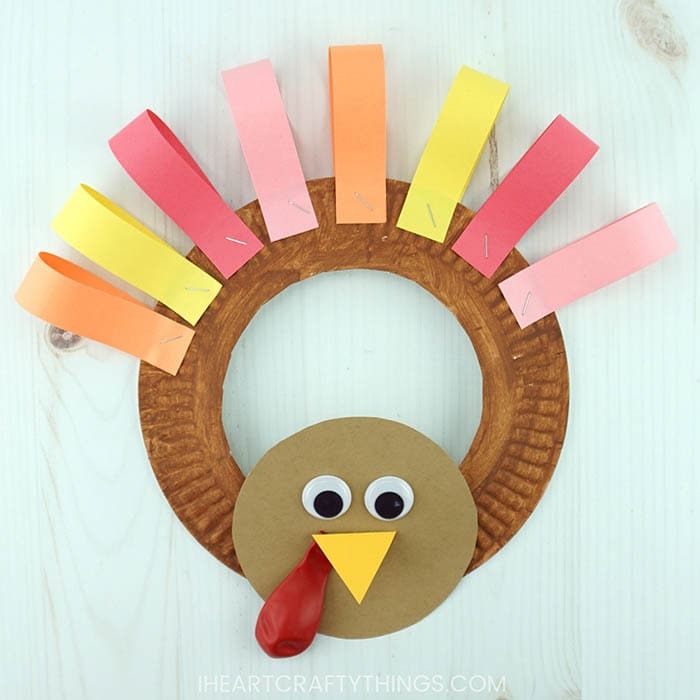 This colorful kids turkey craft makes a great craft for Thanksgiving and it also couples as a way for toddlers and preschoolers to practice color matching. After the turkey craft is made, kids glue colored tissue paper squares on the corresponding colored turkey feathers. Have you ever tried the black glue and watercolors art technique? This black glue turkey art project is fun for kids and the end result is stunning. Here is a fun way to recycle newspaper into a colorful mixed media newspaper turkey craft. These apple turkeys have been a tradition in my family since I was a kid and now they are still a favorite for my kids to make every Thanksgiving. You have to give them a try!